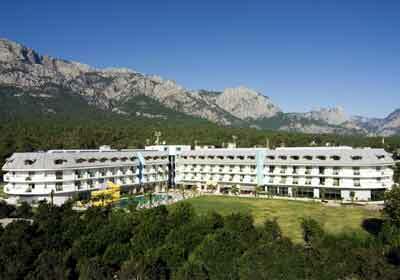 Kemer Reach Hotel is in the center of Kemer, 50 km. away from Antalya airport, 45 km. 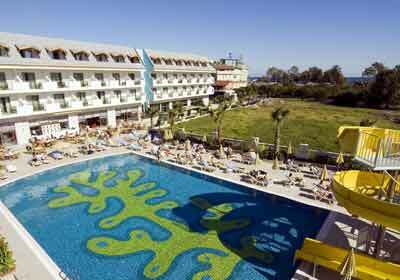 away from Antalya and 200 meters away from the beach. 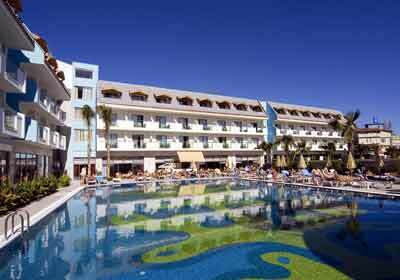 Outdoor swimming pool * indoor swimming pool * waterslide * mini club * vitamin bar * 3 bars * wireless internet service. 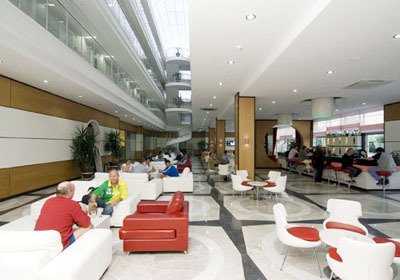 Laundry & dry cleaning * first aid & health services * room service * 24.00 – 08.00 lobby bar * shopping center * internet. Carpet * split air conditioning system * satellite TV * hair-dryer * safe box * telephones in the bathroom and bedroom * in standard rooms bath * in wide standard rooms shower * in suit hydro massage shower cabinet. Private sunbeds and umbrellas are at your service, free of charge at the beach. Breakfast, late breakfast, lunch, snack hotel, snack beach, tee time, dinner, night snack, 08.00 – 24.00 lobby bar, pool bar, beach bar, vitamin bar, fitness center, table tennis, aerobic, billard, sauna, Turkish bath, steam room.